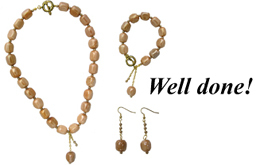 chain, 4 crimp beads, 4 bead caps, 6 small gold beads, 36 x 12mm nugget-shaped beige gold luster glass beads, 45 x 4mm gold smooth glass pearl beads. THE BRACELET: Cut 1 piece of wire of approximately 12 inches. 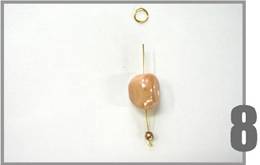 Thread a bead cap and a crimp bead onto the wire. 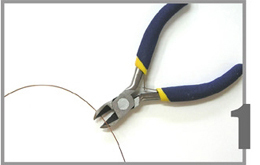 Squeeze the crimp bead at the end of the wire. Cover the crimp bead with the bead cap. Fold the loop on the bead cap over. 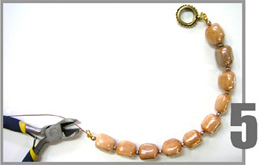 Attach a jump ring and one side of the toggle clasp. 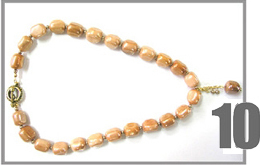 Thread 9 glass pearl beads and 8 beige gold luster glass beads alternately onto the wire. 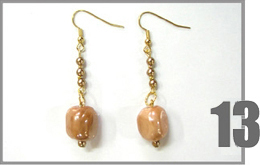 Begin with the glass pearl bead. 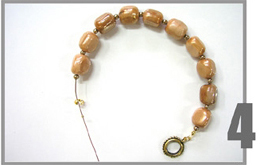 Thread a bead cap and a crimp bead onto the wire. Squeeze the crimp bead close to the beads. Cover the crimp bead with the bead cap. Fold the loop on the bead cap over. 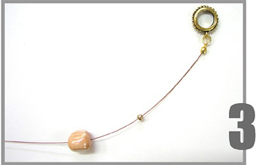 Attach a jump ring to the loop of the bead cap. Attach the other side of the toggle clasp to the jump ring. 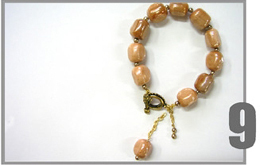 THE BRACELET DECORATION: POST A: Thread 1 glass pearl bead, 1 small gold bead and 1 glass pearl bead onto a post. Attach a chain of 7 links to the folded end of the post. 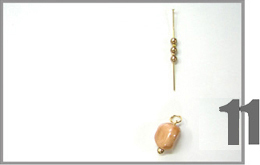 POST B: Thread 1 glass pearl bead and 1 beige gold luster glass bead onto a post. Attach a chain of 10 links to the folded end of the post. 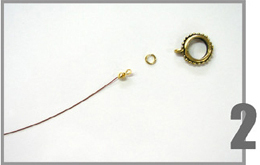 Attach POSTS A and B to the jump ring which is attached to the toggle clasp. 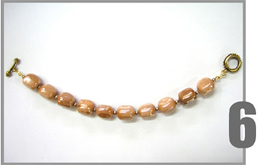 decoration can be hung in the middle of the necklace, in the front. 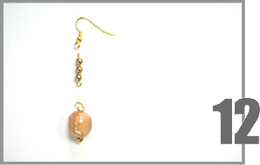 THE EARRINGS: POST A: Thread a glass pearl bead and a beige gold luster glass bead onto the post. Fold up the end of the post. 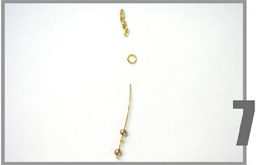 earring hook to the other side of POST B.
Repeat these steps to make a second earring.